Parachute, Created in collaboration with Henry Sabin Elementary School students, 1973 | Single channel video with sound; TRT: 7:09 minutes; Courtesy of the Estate of Ana Mendieta Collection, LLC and Galerie Lelong & Co.
Big questions are presented to our wee viewers as a platform for celebrating the immense intelligence of children. Conceptual artist Ana Mendieta (Havana 1948 – New York 1985) is best known for creating art that speaks boldly to adults, but Thinking features works that are strikingly in dialogue with children. In this exhibition children are encouraged to reflect on notions of power and freedom through verbal and physical exploration. 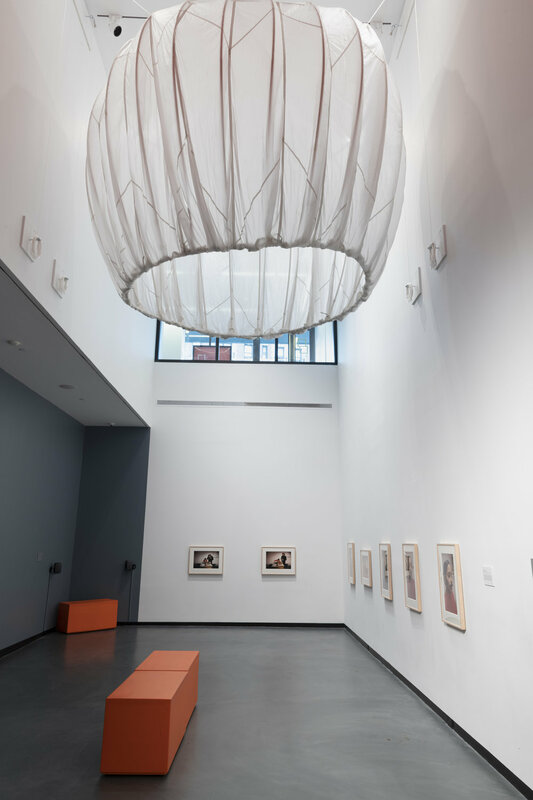 Playfully central to this exhibition is a parachute, a mustache, and an interview from 1973 conducted by the artist with elementary school students. This exhibition spotlights a sound art piece, videos and a series of photographs, about collective and individual experiences located deep within and outside of one's self. This year Ana Mendieta's art and ideas are informing a host of museum programs, children's books selected for independent reading and Studio Lab activities to activate brainpower, imagination and employ gut instincts. 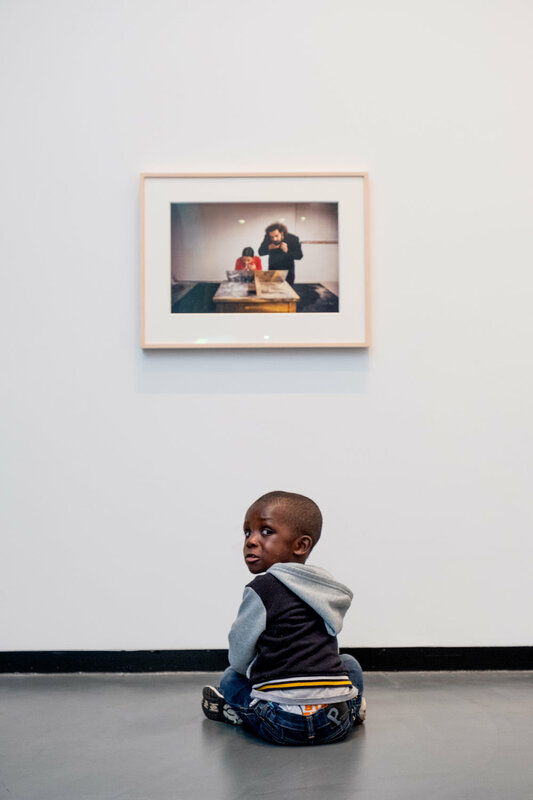 Ana Mendieta: Thinking About Children’s Thinking is the first museum exhibition ever devoted to exploring the artist’s work in relation to children, and is guest curated by Amy Rosenblum Martín. This exhibition is aligned with the Museum’s mission of nurturing the curiosity and creative spirit of three-to eight-year-old children. Ascribing the virtues of conceptual art in the Museum's Legacy Gallery, this year, provides a unique opportunity to expand upon the Museum's ongoing celebration of the intellectual freedom associated with the legacy of the Harlem Renaissance as being located in Sugar Hill. Ana Mendieta began her career at the University of Iowa, were she initially received a degree in painting in 1969. It was not until 1972 that Mendieta profoundly elected to engage in performance art. She is best known for her “earth-body” artwork, a series of over 200 works of art that focused on a spiritual and physical connection with the earth. Since her death in 1985, Ana Mendieta has been recognized with numerous retrospective exhibitions in such venues as the Art Institute of Chicago and the Whitney Museum of American Art. Mendieta's work is also featured in many major public collections, including the Solomon R. Guggenheim Museum, Metropolitan Museum of Art, Museum of Modern Art, all New York, Centre Pompidou, Paris, and Tate, London. We are grateful to the Swiss Institute for additional support of this project, The Estate of Ana Mendieta Collection, LLC and Galerie Lelong & Co.